Audeo B Direct Australia's cheapest price 10% price beat guarantee! All hearing aids have a range. The levels in a hearing aid range refer to the number of software features on the hearing aids processing chip. The more software features in the hearing aid processing chip, the higher the hearing aid is in its range and the higher the price. Hearing aids at the top of a range process sound better and improve the wearer’s ability to hear when compared to those at the lower levels in the hearing aids range. 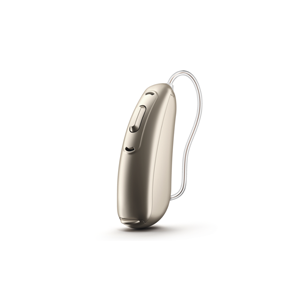 Features such as Bluetooth, rechargeable and small sizes are standard features across a hearing aid range and do not change the price. Only the hearing aids software level determines the amount the hearing aid costs and its ability to process sound better. Hint: Choose a hearing aid that helps in noisy situations that you frequent. Example: Cafes, backyard BBQs or concerts. Hint: Your EarDeals clinician will provide you with a free comprehensive hearing test and provide a list of options to consider. 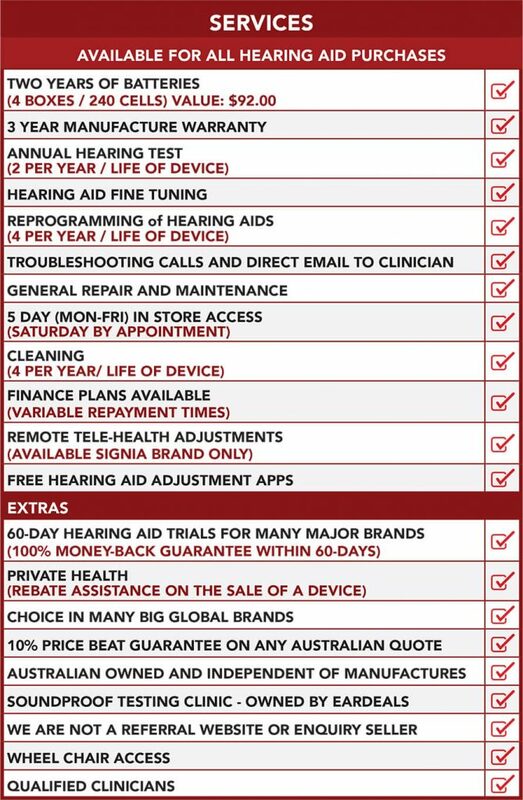 Depending on your hearing loss the clinician can offer you a number of brands with many great features. Hint: When Choosing the right hearing aid it’s important to consider the latest developments in hearing aid technology. Such features as Bluetooth connectivity may appeal to those who are constantly on the phone. With the rechargeable battery feature of some hearing aids, you may have dexterity issues; not want to worry about buying batteries or simply be environmentally conscious. You can read more about the hearing aids software features and compare them by clicking on the hearing aid images above. What technology level in the hearing aid range do I need? The easiest way to determine which hearing aid technology level you need for your hearing loss is by asking EarDeals for a free 60 day trial of a number of hearing aid technology levels. You can then hear the difference between the levels for yourself risk-free. To start a hearing aid trial, simply book a free comprehensive hearing test and then have a hearing aid fitting at the Ear Deals clinic.